In the meantime, German Chancellor Angela Merkel defended the Mistral sale to Russia, explaining, “The question of exports to Russia falls under [EU sanctions] stage three. About when to trigger stage three, if there is more destabilization we have agreed, also myself bilaterally with the U.S. President, that if [Ukrainian] elections take place we won't trigger stage three. We see elections have taken place successfully…” This explains Putin's rather timid public acquiescence to and apparent non-interference with the recent election of Petro Poroshenko as president of Ukraine. Further complicating the situation for Europe, the projected Nabucco gas pipeline that would carry Caspian gas into Europe bypassing Ukraine, has been abandoned, after the promoters failed to obtain secure gas supplies from Azerbaijan. In a previous article I wrote : “ If Azerbaijan decided to abandon the Nabucco project in favor of the South Stream project, this would probably spell doom for Nabucco. 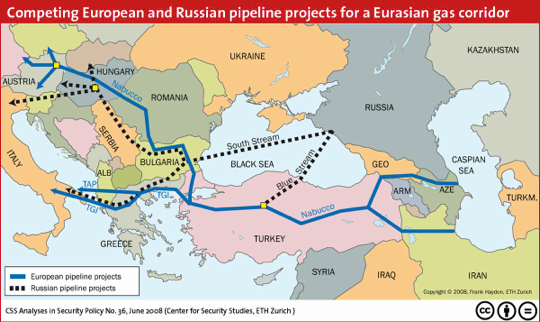 Clearly, Russia's strategic chess moves are intended to corner the European natural gas and pipeline markets to both Eastern and Western Europe.” Almost three years later this is what took place . The winning alternative was not Nabucco but the Russian controlled South Stream, a proposed 1,500 mile pipeline from Russia, running under the Black Sea, through Bulgaria and Serbia to Hungary and Austria, bypassing Ukraine, which will bring natural gas to Europe through an Austrian hub. Due to Nabucco's demise, Europe's feeling of dependence on Russian natural gas is now significantly stronger. The main threat to Europe is a disruption of the natural gas supply from Russia, as a byproduct of the crisis in Ukraine. Disruptions have taken place already twice before, in 2005 and 2009. Now in 2014, Putin's state energy monopoly Gazprom has announced , once again, that it is suspending natural gas deliveries to Ukraine. However, the recent elections in Ukraine might go a long way in defusing the possibilities of a future major disruption. The Wall Street Journal affirms that tensions between Russia, Ukraine, the U.S. and the European Union have diminished after: “ a pro-Europe chocolate baron was declared the victor of Ukraine's fraught presidential election, and Russia continued increasingly conciliatory overtures toward its neighbor, which has accused it of inciting insurrection and grabbing its territory.” The election of Petro Poroshenko has been received by Russia with placatory statements. Russian President Putin declared in Saint Petersburg: “ By all means, we will respect the choice of the Ukrainian people and will be working with authorities formed on the basis of this election.” In spite of these protests it seems clear that the dangers of a major confrontation involving Russia and Ukraine, with its potential effect on Russian natural gas supplies to Europe, have been greatly minimized, at least for the time being. The central question of European dependence on Russian gas remains essentially unaltered. Due to slow action by Europe, its dependence on Russian gas has stayed at similar high levels for many years. According to the Economist : “making a real dent in Europe's reliance on Russian gas will take political will, money and the best part of a decade, merely moving in that direction will shift the balance of power because it will signal a fundamental truth: in the end, the Kremlin needs its European customers at least as much as they need Russian imports.” There is no medium-term alternative to Russian natural gas that can provide Europe with the energy it requires. A unified European Energy Policy is far from being a reality. “Europe has an energy policy – just say ‘no'. Germany's Chancellor Merkel says ‘nein' to nuclear power. France's President Hollande says ‘non' to shale gas. Britain's Prime Minister Cameron says ‘no' to wind power unless it is a few kilometers out to sea. Poland's Prime Minister Tusk says ‘nie' to any limit on burning brown coal – lignite – the most polluting of any fossil fuel… the EU's energy policy is incoherent to the point of non-existence.” Meanwhile, the report adds: “Gazprom sponsors football clubs in Germany, hires the daughter of Romania's President Basescu as its lawyer in Bucharest, and most famously, has the former German chancellor, Gerhard Schroeder, on the payroll.” The Russians seem to know exactly what to do to promote European dependence on its natural gas. Gustavo Coronel is a 28 years oil industry veteran, a member of the first board of directors (1975-1979) of Petroleos de Venezuela (PDVSA), author of several books. At the present Coronel is Petroleumworld associate editor and advisor on the opinion and editorial content of the site . All his articles can be read in Gustavo's blog. Las Armas de Coronel . Petroleumworld does not necessarily share these views. Editor's Note: This commentary was originally published by Selous Foundation for PublicPolicy Research (SFPPR), on July 16, 2014 . Petroleumworld reprint this article in the interest of our readers.